Fitness, it is on the fast track and has been trending across the United States for years. Exercise moves and routines are recycled, new twists and improvements are added to make them the latest “new old” craze across all age groups from the very young to seniors. When it comes to physical activity to increase a heart-rate, the options are unlimited. Any type of physical activity can be transformed into an exercise routine and before the person knows it, all the fun they had translates into tremendous health benefits. Safe and fun exercises are important with senior activity in mind. For obvious reasons, and maybe the not so obvious seniors need to take special care in how they exercise. The body is older and more fragile than a younger person’s is. The good news is there are many fun activities seniors can participate in to reap the many health benefits they deliver. Shuffleboard, a popular game for centuries across the world got its start in a pubs and palaces during the 15th Century in England. Since its inception, the objects used to play were switched out to suit the time and place in Shuffleboard history. The game has endured many name changes since it evolved as well, but shuffleboard rules and the game’s objective have mostly remained the same. 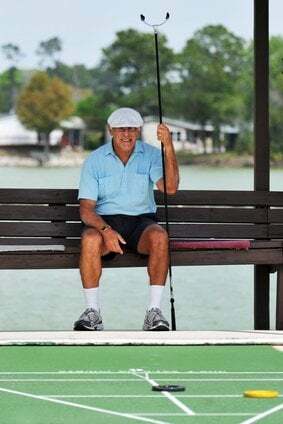 Most importantly, it has remained fun and brings with it health benefit rewards seniors can enjoy. Shuffleboard rules can vary, but there are general rules and objectives that apply. While it is true the Shuffleboard game is fun, it takes skill to win. The two types of Shuffleboard games played are one is indoors and one played outdoors, but the objectives are the same. A player wins when a score of 15, but can continue up to 21 points in some tournaments is reached. Each player, taking alternate turns slides each of their four weights (by hand) across the board against their opponent(s). The objective is to slide the weights into the highest scoring area, outdistancing their opponents without falling off the end into the alley. To score points, a player’s weights must be the ones resting the farthest down the board. Players try to knock their opponent’s weight off the board. Players use their weights to protect their highest scoring weight. Bocce history, first documented as far back as 5200 B.C., starts in a painting of two boys playing bocce ball discovered in an Egyptian tomb by Sir Francis Petrial, an English Scientist. Bocce Ball has gone through many changes throughout time evolving from a crude sport played with rocks or coconuts, to the modern metal or composite balls used today. It has seen multiple rule changes and has held many titles; nine pins, lawn bowling, pentanque, skittles and others. Weekly Bocce tournaments are held by casual players across the U.S. and are a Special Olympics event, part of the World Corporate Games and being considered by the Olympic Games. 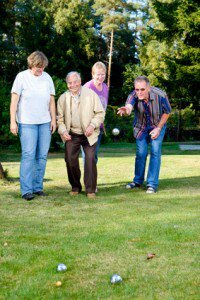 Playing Bocce Ball is a fun, friendly, competitive game of skill to play and comes with its own set of health benefits for anyone participating. An additional attraction of the game is it is an excellent activity for seniors to take in safe exercise. The most popular Bocce Ball game is Open Bocce among casual players. Its popularity is due to the ability to be played in almost any open space; front/back yard, open grass or dirt field, the beach or a paved parking lot. The rules are pretty simple and the player’s objective is to get the bocce ball to land and rest as closer to the panillo than the other players. A random player is chosen and throws the pallino – the same player throws the first bocce ball. Player is now considered “inside” because by default his ball is the closest to the pallino than the other opponents (“outside”). “Inside” player forfeits his turn until a second player removes him of the closest position and becomes the new “inside”. Taking turns all outside players throw their bocce balls until one lands closer to the pallino. After all players have thrown all balls, the player whose ball is closest to the pallino scores one point; plus one point for each of his balls closer to the pallino than the his closest opponent’s ball. One point – When a player’s bocce ball lands the closest to the pallino he scores a point. The frame is complete after all players have thrown all their balls and points have been awarded. The game is won when a player scores 13 points. When you think of aerobics, you may think of over exerting, fast movements that wear you out and make you sweat a lot. The truth is everyone; especially seniors should include 30 minutes of aerobic exercise in his or her daily routine. It is good for the heart, gets the blood flowing and keeps you in shape. Luckily, for us there are many alternatives to the old exercise routines of aerobics. Dancing for example, is a fantastic activity to reap the same health benefits and you do not have to have good rhythm to do it. Anyone can dance to a healthier them in the privacy of their own home. The health benefits of dancing as aerobic exercise for seniors, vastly improve overall health. The constant movement in dancing (at your own set pace) elevates your heart rate pumping oxygen faster through your blood. This is what makes it aerobic or in medical terms, cardiovascular. Yoga is a discipline practiced consisting of controlled body positions and stretches, meditation and controlled breathing for physical, mental and spiritual well-being. The intent of yoga is to reach a state of deep spiritual insight and tranquility. Yoga is believed to be over 5,000 thousand years old and its popularity has been stood the test of time. Yoga is low impact and a great way to get the exercise required to stay in good health, offering a list of health benefits. Because it is made-up of gentle, low impact movements, it is ideal for any fitness level. For example, results from simple yoga stretches for seniors improve a range of physical overall wellness. As with anyone, seniors stand to gain other benefits that come from practicing yoga regularly. 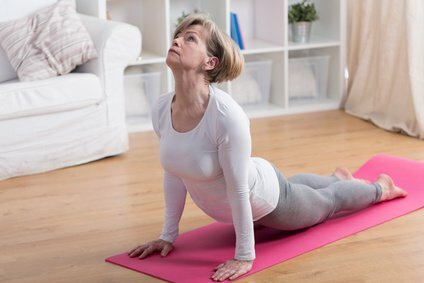 Health benefits of yoga for seniors range from better sleep to getting a peace of mind, to increased self-esteem and encouraging self-care.